This year there will not be a specific iris sale weekend. Changes in the seasons (climate change?) has made a peak iris bloom unpredictable. Additionally we are short on a number of Iris but have small numbers of quite a number of unusual Siberians. Check our facebook page for some of the newer varieties and keep checking for notification of any Iris sales. Here Jasper digs a typical saleable piece for a customer. 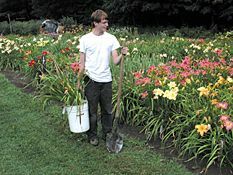 Early June is a great time to visit Olallie Daylily Gardens. The Siberian Iris is in full bloom and most of our early daylilies are out too. 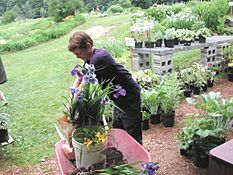 An excellent time to transplant, people often pick up an iris or two and some daylilies for later in the season. 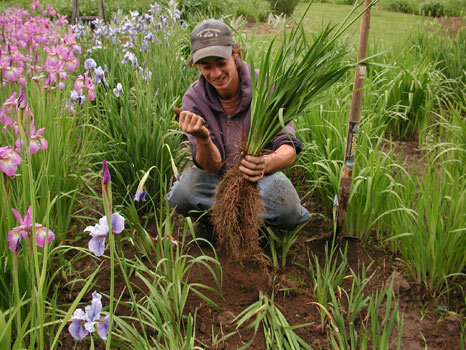 Jacob bags up some freshly dug iris for a customer. Peak season, typically from mid July through mid August is a magical time. Tens of thousands of blooms appear each day. It is worth the trip to see the diverse spectrum of daylily cultivars, colors and types. There is plenty of room to stroll the gardens and plenty of seats to sit and enjoy the view. Many people plan an afternoon and bring a lunch. during peak season at our farm. 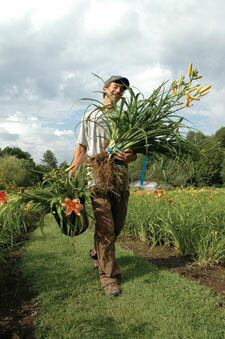 Jasper carries an armload of freshly dug daylilies, to waiting customers. On the right Chicago Ruby blazes in mid July.